The gift of sight is so precious and is something we, as humans, undeniably take for granted. Being able to see vibrant colors and watch the beauty of life happen before our eyes – it’s truly fascinating. That is one of the things Dr. Jon Gudeman has learned throughout his career as an optometrist. Dr. Gudeman is the lead doctor at our Salem office, and has been a part of the Invision team since 2001. Dr. Gudeman always knew he wanted a career in the medical field, but wanted to do something non-invasive. His journey to becoming an eye doctor began at The Ohio State University, where he received a Doctorate of Optometry in 1996. Coupled with his love for the Roanoke Valley and optometry, Dr Gudeman has admiration for the colleagues he works alongside at Invision who all have a similar passion: help patients feel and see better. Together, the team navigates through their day-to-day work, with no one day ever looking the same. “You never know what kind of problem you will have to diagnose or solve on any given day,“ Dr. Gudeman shared. Dr. Gudeman takes particular interest in ocular disease management, children’s vision, and contact lens fitting. He is an active member of the American Optometric Association, past president of the local Southwest VA Optometric Society, and member of the VA Optometric Association. His fascination for vision and treating patients is evident by the way he discusses vision. Some of his favorite facts about eyes include that the eye has over 2 million working parts and 80 percent of vision problems worldwide are preventable or curable. However, serving the greater community doesn’t stop once Dr. Gudeman leaves the office. Over the years he has participated in mission trips to Sudan, Congo, the Philippines, and India – just to name a few. During these trips, he has the opportunity to restore vision to people who lack access to medical or vision care. He was particularly moved during a trip to Congo, where he crossed paths with a man who was functionally blind and being led around by his father because he couldn’t see well enough to walk freely on his own. “As it turned out, he was simply very nearsighted,” Dr. Gudeman shared. “All he needed was a pair of glasses and suddenly, the young man could see! That was a powerful moment to see a life trajectory completely changed by something we often take for granted.” Mission trips have also taught Dr. Gudeman that people from all walks of life are very similar, often sharing the same hopes, dreams, aspirations, and love for family and friends. 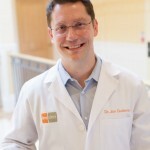 Serving his patients is something Dr. Gudeman takes pride in, and is also an important aspect of the Invision brand. His team strives to set themselves apart by offering patients a comfortable and positive experience with a beautiful, clean and comfortable office with great customer service. “A little kindness goes a long way, so we strive to be kind and attentive and respect our patients time,” Dr. Gudeman explained. Invision utilizes cutting edge technology to offer patients high level medical care as well as top quality eyeglass and contact lens products. We are very fortunate to have Dr. Gudeman as a part of the Invision team, based out of our Salem office. His expertise and love for optometry is inspiring and allows patients to rest assured they are receiving the best vision care possible.